Kincumber High School is proud to announce the launch of a new partnership agreement with HP to recommend and provide appropriate devices for our students. We often get questions from families about the most appropriate device to support the learning of their student. This HP portal shows four devices in total. These devices span a considerable price range and are all appropriate devices for learning in our school. 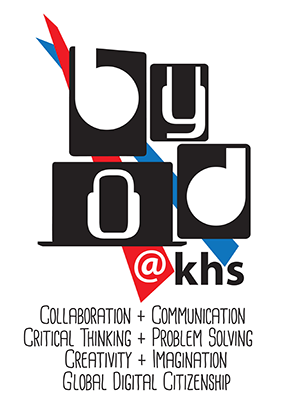 BYOD Program commenced in Term 1 2015. · Bring Your Own Device (BYOD) Program – consisting of phones, tablets and laptops. i.e. no minimum screen size. · NOTE: there are some legitimate but limited uses of phones as learning devices, however, they are not to be the primary BYOD device. · Years 7-12. All students will have permission to BYOD, however, it is up to the individual teacher to determine the volume and frequency of technology based activities in the classroom. Bring Your Own Device or BYOD program allows a student to bring a personally-owned technology device such as a smartphone, tablet or laptop from home and use it to connect to the school's DEC Wi-Fi network. Devices must be primarily for learning and all users must submit a signed BYOD Student Agreement before accessing the Wi-Fi network. The widespread availability of wireless internet-enabled devices. The integral nature of these devices to the students' own world. The possibility of leveraging students’ attachment to their own devices to deepen learning and to make learning more personalised and student-centred. Kincumber High School has adopted a platform of 21st Century or future-focussed skills to inform our use of technology in learning and to prepare our students for a technological future. Collaboration and Communication- work cooperatively with others, at Kincumber High School and across the globe, embracing flexibility and compromise, to articulate a range of ideas in a variety of creative, digital forms. Critical Thinking and Problem Solving- using various types of reasoning to apply to a range of contexts. Responding to challenges using conventional and innovative solutions. Creativity and Imagination- work creatively with others to invent and develop new and exciting concepts and ideas. Global Digital Citizenship- preparing students to participate in a an increasingly accessible worldwide network where an understanding of their own safety, rights and responsibilities is essential for a positive future. Participation in BYOD is absolutely voluntary. Families are not required to purchase a technology device to support their student's learning. Students and their families are free to choose a device that best suits them according to the school's BYOD specifications. Below are the devices that appear to work well within our school environment. Please note: The department's Wi-Fi network installed in high schools operates on the 802.11n 5Ghz standard. Devices that do not support this standard will not be able to connect. Update: 802.11ac will also connect to DEC Wi-Fi. Before purchasing a BYOD device you will need to confirm that the device's wireless capability is compatible with the School's wireless network. Wireless networks operate on the 2.4GHz and/or the 5GHz band. The Kincumber network operates only on the 5GHz band. Each device will have details of its wireless capability in its Technical Specifications and it will look similar to one of these examples: 802.11 b/g/n, 802.11 ac/a/b/g/n, 802.11 (b/g/n/ac) etc. Each letter code after the 802.11 represents a different standard, the order in the list does not matter. The 'ac' standard fully supports both 2.4GHz and 5GHz and can therefore be used at Kincumber. The 'n' standard can provide 5GHz but it is at the option of the manufacturer, the specifications for the device will need to state that it is dual band for it to be able to be used at the school.